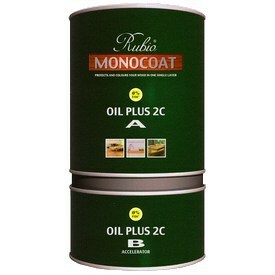 Rubio Monocoat Oil Plus 2C is a product of the newest generation which colors your wood and protects it in one layer. The combination of the oil (A) and the accelerator (B) guarantee a quick drying. Can also be applied as renovation and maintenance oil on surfaces which are oiled with RMC. 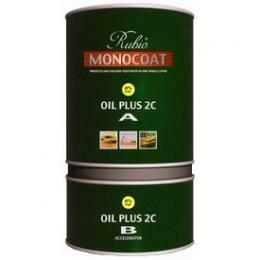 Monocoat Oil Plus 2C is applied in one layer and cures in 7 days. 1 liter of Monocoat Natural Oil can cover an average of 400 sq. ft. with one application. 3 gallons (11.4 liters) of Conventional Finishes and three applications are needed to achieve the same result. - Molecular bonding with the wood: durable protection!